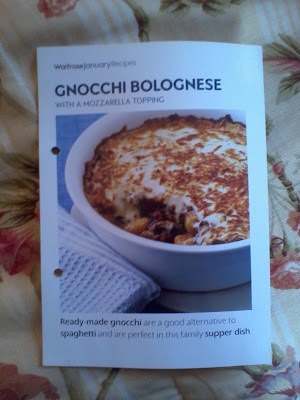 I love the gnocchi bolognese recipe we got off a card from Waitrose. 50g grated mozzarella, or whatever tickles your fancy. 1. Preheat oven to 180 degrees C / gas mark 4. Fry beef, onion and garlic until onion starts to soften. 2. Stir in mushrooms and cook for a further 5-6 mins until meat is browned. Pour the pasta sauce over, bring to the boil, season with black pepper, then cover and simmer for 15 mins. 3. Meanwhile cook the gnocchi according to packet instructions. Drain well. 4. Spoon half the Bolognese mixture into an ovenproof dish. Top with the gnocchi. Add the remaining Bolognese mixture, spoon the cheese sauce over the top, sprinkle with the mozzarella/whatever. 5. Bake on the top shelf for 30-35 minutes. Serve with salad and an excellent red wine.